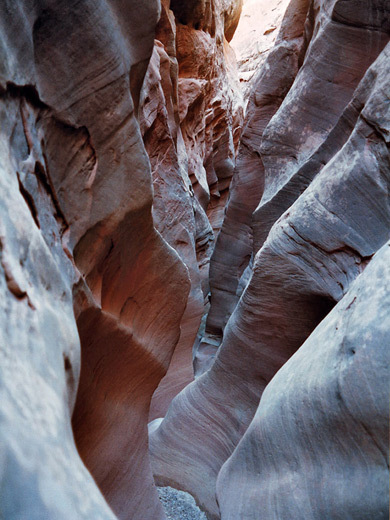 Because it is just 5 miles from the popular Goblin Valley State Park, is easily explored, and has narrow passages as fine as any other Southwest slot, Little Wild Horse Canyon has become the most visited location in the San Rafael Swell. One hour is enough to see the best sections along its lower end, although the usual plan is to combine a tour with neighboring Bell Canyon - this is an 8 mile loop that in addition to the two narrow gorges also passes high, colorful cliffs and much interesting exposed, eroded rock. There are various places good for camping further along the access road - pleasant, free alternatives to the nearby paid site in the state park. Bell & Little Wild Horse are one of several pairs of short, narrow canyons that cut into the southeast corner of the San Rafael Reef - others include Crack & Chute, Ding & Dang, and Cistern & Ramp. 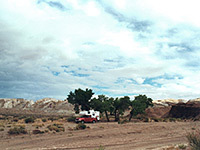 All may be reached starting from the paved Temple Mountain Road, which leaves UT 24 at milepost 137 and heads due west across a flat, desert plain, then passes through the reef where it becomes unpaved and forks several times - one branch is the Chute Canyon Road (also known as the Behind-the-Reef Road), which can be used to reach the upper end of some of the canyons. The main route though is to take a turning south before the reef, onto the Goblin Valley Road then turn west after a few miles on a recently-paved side road just before the state park. The road reaches the Little Wild Horse trailhead after another 3 miles - this has a small carpark, a trail map and a register for the hike. Thereafter, the road is unpaved and the surface deteriorates somewhat as it follows a stony streambed; the road eventually meets Muddy Creek, the main river in the southern swell, just downstream of its lengthy narrows section ('The Chute'). Along here are a number of good camp sites. The upper ends of Bell and Little Wild Horse canyons can also be reached by an old mining track, a continuation of Chute Canyon Road, but at this point motorized travel is prohibited, and indeed this track now has no visible sign of vehicle use. 10 views of Little Wild Horse Canyon. TopoQuest topographic map of Little Wild Horse Canyon. 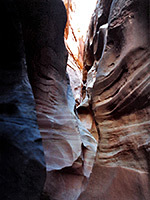 The main narrows of Little Wild Horse Canyon can be reached after just ten minutes walking from the trailhead, though they are easily missed as the entrance is a concealed slit in the right side of the canyon. The following description starts from the upper end, however - a continuation of the loop hike up Bell Canyon. At first, the streamway is wide and stony. Another branch joins from the left then the way ahead remains open for at least a mile, as the wash meanders along while the crumbling cliffs at either side gain height gradually. Eventually the creek forms a short stretch of narrows, interrupted by a 15 foot dryfall, followed by another wider part before the walls finally close in - from here the next half mile or so is very narrow and exciting; at times the floor is just curved rock with no sand or stones, and has cavities that fill with water after flooding but the pools rarely exceed 2 to 3 feet in depth. Wading through these potholes can generally be avoided by straddling the rocks above. This part of the canyon is deep yet still quite open but later the rocks become more curvy and the cliffs above overhang - the passageway from here onwards is darker and more mysterious, and sometimes just 3 feet across. Occasional pretty patterns of light and reflections filter down into the canyon although this part is aligned east-west, and is sufficiently deep to be in shadow most of the day. In several places the floor drops by a few feet but there are no difficult obstacles. Little Wild Horse is as good as the famous Antelope Canyon in places, just not so well lit. The narrows end in a long straight section, after which the ravine widens somewhat and the junction with Bell Canyon is reached after another few minutes walking, from where the trailhead is a short distance further south. The hike - or at least the lower part of the narrows - has become quite popular yet the environment remains generally unspoilt, with no litter.